Flora Dane survived when no one thought she would. Everyone knows the first 24 hours of a missing persons case are crucial but it takes a torturous 472 days for her to escape her captor. After a year of being mostly confined to a pine coffin, she returns to her family as a different person. Five years later and she finds herself was taken by another monster but this time she’s ready, this time she knows what she’s doing and before he has a chance to hurt her she uses the objects around her and sets him alight. Detective D. D. Warren is called to the scene and quickly looks into Flora’s past, there’s a pattern of her using self-defence against men over the last few years but do they find her or is she the one going out there and looking for these monsters? Is she inciting crimes or is she genuinely trying to help find other women that never came home? This is my first time reading Lisa Gardner and although Find Her is book eight in the D.D Warren series this novel is the perfect point to jump in and works perfectly as a stand-alone story. Flora is a great protagonist and although you cannot relate to her situation you completely empathise and understand her actions as she tries to move on from such a lengthy, traumatising event. As a reader, you’re cheering her on until Detective D. D. Warren questions her motives. Vigilante killers can make for some of the best crime characters (Dexter for example) but they are often hiding their actions, which makes Flora’s obvious guilt and Warren’s difficulties in treating her openly as anything but a victim so fascinating to read. Just when you think you know where the story is going, Flora is abducted and certain circumstances become all too familiar to her, especially the pine coffin. Find Her is packed with so many twists and turns it’s virtually impossible to find a page where you’re happy to put it down because you simply need to know what happens next. 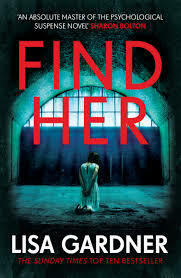 Dark, disturbing and utterly addictive Find Her is truly unmissable. I’ll definitely be reading more from Lisa Gardner soon!